Flora is an oil painting by Italian late Renaissance painter Titian, dated to around 1515 and now held at the Uffizi Gallery in Florence. It portrays an idealized beautiful woman, a model established in the Venetian school by Titian's master Giorgione with his Laura. Her left hands holds a pink-shaded mantle, while another holds a handful of flowers and leaves. Tiziano Vecelli or Tiziano Vecellio (c. 1488/1490 – 1576 better known as Titian) was an Italian painter, the most important member of the 16th-century Venetian school. 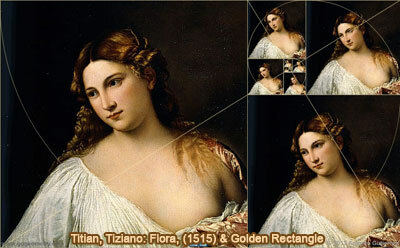 Source: Wikipedia, Titian. A golden rectangle is a rectangle whose side lengths are in the golden ratio, one-to-phi, that is, approximately 1:1.618. A distinctive feature of this shape is that when a square section is removed, the remainder is another golden rectangle, that is, with the same proportions as the first. Square removal can be repeated infinitely, which leads to an approximation of the golden or Fibonacci spiral. The Droste effect is a specific kind of recursive picture, one that in heraldry is termed mise en abyme. An image exhibiting the Droste effect depicts a smaller version of itself in a place where a similar picture would realistically be expected to appear. This smaller version then depicts an even smaller version of itself in the same place, and so on. Only in theory could this go on forever; practically, it continues only as long as the resolution of the picture allows, which is relatively short, since each iteration geometrically reduces the picture's size. It is a visual example of a strange loop, a self-referential system of instancing which is the cornerstone of fractal geometry. Source: Wikipedia, Droste Effect.